Living in the Midwest, one is never want for access to pork or poultry, but there are many occasions when I have a hankering for fresh fish. David ran across an exceptionally good deal on rainbow trout (that involved free smoked trout, to boot! 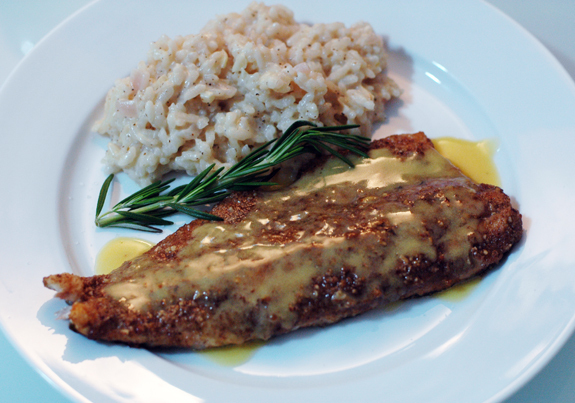 ), motivating my search for a new and interesting recipe for trout. A combination of wanting to use the existing herbs in our fridge, as well as my curiosity about a sauce involving orange juice, led to the selection of this particular recipe. Combine pecans and a tablespoon of flour in a food processor. Grind pecans finely and transfer to a plate. Place remaining flour on another plate. Sprinkle fish with salt and pepper. Dip fillets in flour to coat and shake off the excess. Brush flesh side of the fillets with egg. Press flesh-side down into the pecans to coat with nuts. To make the sauce, combine the first 6 ingredients in a saucepan. Boil 10 minutes; add rosemary. Boil until liquid is reduce to 1/2 cup, about 10 minutes. Strain sauce into another saucepan. Add cream and bring to a boil. Reduce heat to medium-low. Whisk in butter, one piece at a time (do not boil). Season with salt and pepper. Melt a tablespoon of butter in a heavy large skillet over medium-high heat. Place 2 fillets, pecan side down, into skillet. Cook until crust is golden and crisp, about 2 minutes. Turn fillets over and cook until opaque in center, about 2 minutes. Repeat with remaining fish. Spoon sauce over fish and serve. David was, at first, somewhat skeptical of the sauce, mentioning that it tasted a bit sour on its own. However, combining it with the sweetness of the trout and the wonderful, nutty, roundness of the pecans, elevated everything. It was a surprisingly delicious meal. David noted that the pecans really made the dish. Definitely one for the books!